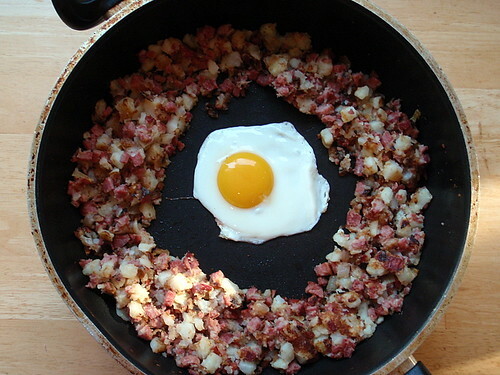 I've never really been into corned beef hash, even though I love potatoes, probably because I've only ever had the canned kind. Which is gross. But I had all this leftover corned beef from making the St. Patrick's Day maki and saw this recipe, so I figured I might as well try. Actually, I did more than try; I went to Whole Foods at 8 am in the morning to get some onions because we were out just so I could try this recipe. And boy am I glad I did. Homemade corned beef hash is so exponentially better than the canned stuff, and it's pretty easy to make too! Heat butter or fat in a large skillet (preferably cast iron) on medium heat. Add the onion and cook a few minutes, until translucent. Mix in the chopped corned beef and potatoes. Spread out evenly over the pan. Increase the heat to high or medium high and press down on the mixture with a metal spatula. Do not stir the potatoes and corned beef, but let them brown. If you hear them sizzling, this is good. Use a metal spatula to peek underneath and see if they are browning. If nicely browned, use the spatula to flip sections over in the pan so that they brown on the other side. Press down again with the spatula. If there is too much sticking, you can add a little more butter to the pan. Continue to cook in this manner until the potatoes and the corned beef are nicely browned. Remove from heat, and add salt to taste. Serve with fried or poached eggs for breakfast. So now I had all this leftover corned beef hash and thought, "Why don't I try making pasties out of them?" No, not that kind of pasties, the Cornish kind. They're kind of like empanadas or those beef curry turnovers, but from England. When I visited a few years ago I tried them everywhere I could find them. Not only are they quite tasty, but they're perfect for tourists because you can eat them on the run. While doing some research about them, I found out that sometimes they had two internal pockets: one savory and one sweet so it was like a two course meal in one! 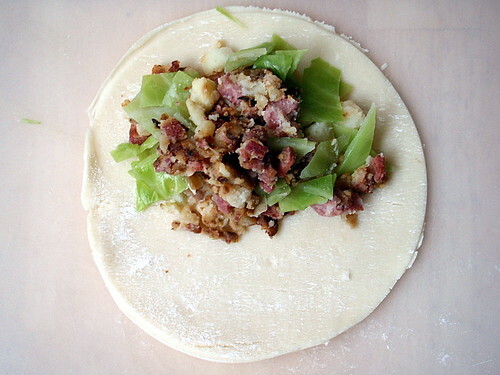 I decided to just stick with the corned beef hash filling, though, and added some of the leftover cabbage as well. Roll out the pie crusts and cut out one 8" circle in each, using a saucer or lid as a guide. Re-roll the remaining dough out and cut out 2 more circles. 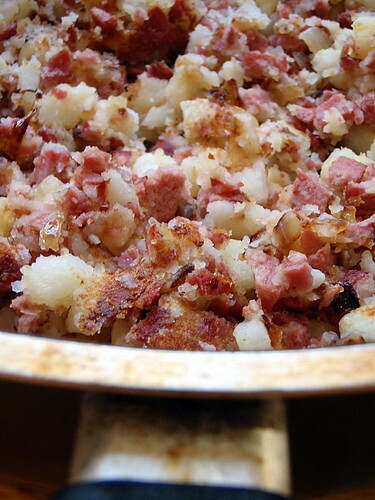 Mix the corned beef hash and diced cabbage together. 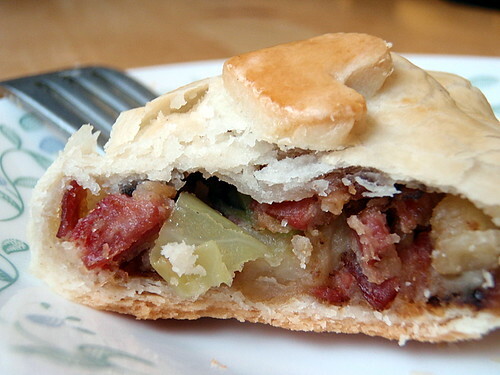 Fill each pie dough circle with about a 1/2 cup corned beef hash mixture. Fold and crimp the edges to seal. You can watch this video to see how I do it for the beef curry turnovers. In a small bowl, add a little water to the egg yolk and beat well. 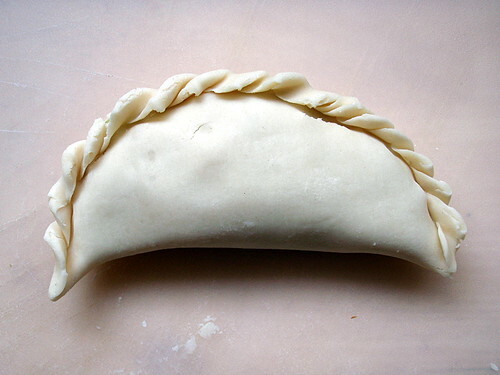 Brush on the top of the pasties. 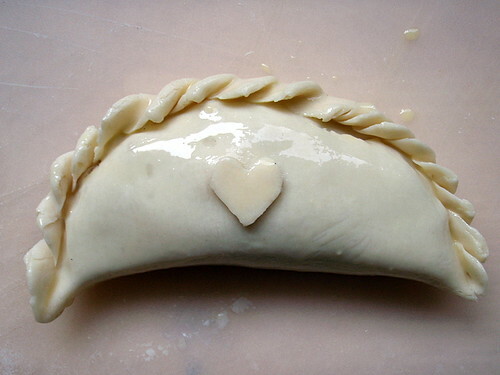 If you like, cut out a decoration with any leftover pie dough and adhere to the pasty using the egg wash. I started with the heart and decided to put a diamond, spade, and club on the other 3. Bake in the oven for 18 minutes or until golden brown. oh yummy im my tummy! i want to eat this now! thanks for sharing. i will let u know tomorrow how it turned out. cya! pasties are also widely eaten in the Upper Peninsula of Michigan - JeanKay's Pasties in Marquette are DELICIOUS!!! That's so funny. I totally got obsessed with pasties last year (eating them and not making them though haha..) I loved the idea of savory meat on one end and a nice sweet treat on the other. the thought of one piece of food being a complete meal just made me really happy :) now I can't wait to try and make some!